Online casinos offering Pay Dirt! Here's a gold mine of a slot opportunity. It's chock full of delightful characters, and has a lot more to it than just hitting the RTG Paydirt! slot up for some cash. Paydirt! Slot is a 5-reel, 25 payline offering that shines like deeply buried gold in the distance, seen out of the corner of our eye. One of the nice RTG Paydirt! 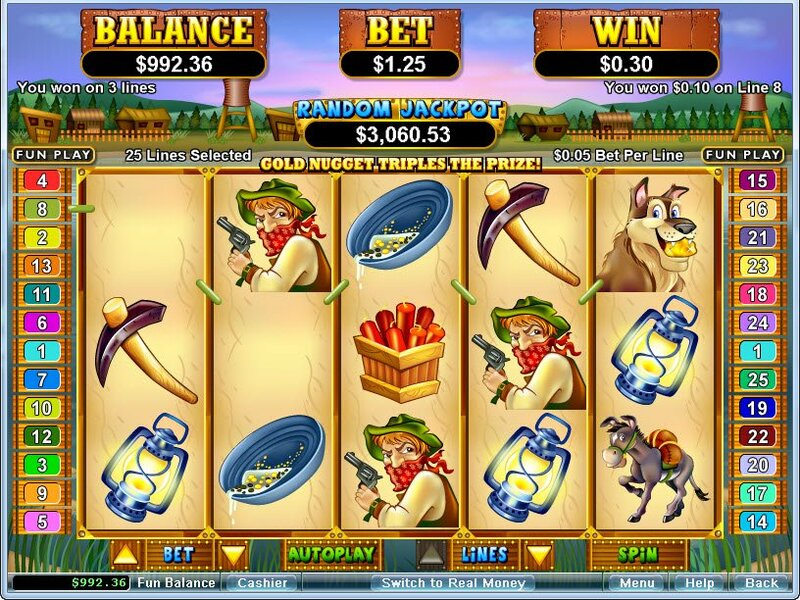 slot features is the random localised jackpot available. There's a real story behind these innovative and charming graphics, there's simply more going on here than we are led to believe. It's not as simple as a team and tools mining to strike it lucky, there's a bandit afoot, complete with gun and wild west style handkerchief over his mouth, a happy miner with a log over his shoulder and no idea what may be about to happen, and the entrance to the mine. I bet that place has seen some action! The Paydirt! 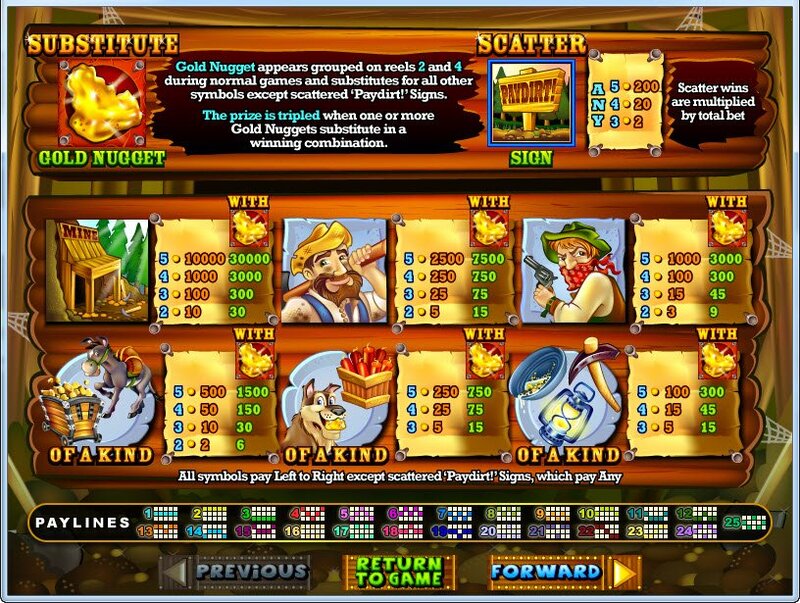 slot jackpot is definitely one of the most attractive features of this slot, but there are also the gold nugget substitute symbol and paydirt sign scatter symbol. Of course there's the ubiquitous chisel, mining lamp and sieve to weed out all the gold from the not so gold. We also have a happy huskie dog, a warm golden brown with a gold nugget in his mouth. There's a cheeky chappy donkey, used for transporting all the Paydirt! slot winning gold. The Paydirt! 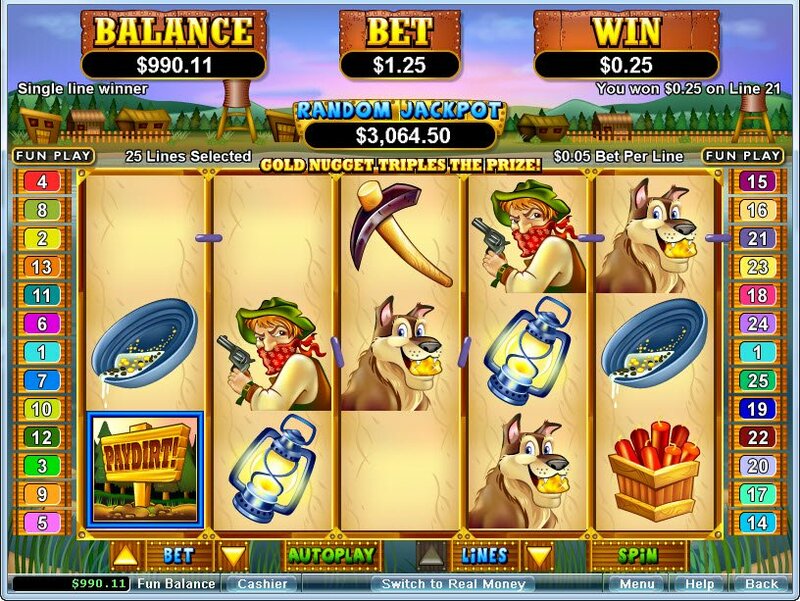 slot jackpot is definitely one of the most attractive features of this slot, but there are also the gold nugget substitute symbol and paydirt sign scatter symbol. They will multiply winnings when found on the lines, and the paydirt sign will trigger either the Gold Rush! Gold Fever! or Strike It Lucky! pick features. Two of these will reward you with Paydirt! slot free spins, the luckiest one of all will award you with entrance to secret goldmines, where extra bonus symbols will give you extra gold nugget opportunities.